Modular Synths - The Ultimate Guide - Andertons Music Co.
Modular synths have undergone something of a resurgence in recent years. Since their first appearance in the ‘60s, they’ve gained something of a cult following – but they’re creeping further and further into the mainstream. You may be taking your first steps, or you might be looking to expand your setup; we’ve written this comprehensive guide to help you navigate your way through the wide & varied world of modular synthesis. Modular synths: how do they work? Introduction: What are Modular Synths? The order you choose to place components in your chain determines how they react to each other, vastly expanding the tonal possibilities. It’s the same principle as a guitarist having lots of pedals on their pedalboard; when you change the order, you (sometimes drastically) change the sound. And much like the guitar/pedalboard analogy, modular synths require a sound source which can then be tweaked and manipulated. This could be a keyboard controller, a sequencer (which can program notes, rhythms and more), or a simple frequency signal. Nowadays, it often begins with MIDI that’s converted into a controlled voltage. This controlled voltage is then fed into an oscillator, which generates an audible (or musical) tone. Then it can be filtered, enveloped, distorted, modulated…the choice is yours! The subsequent chain that you’ve created is often referred to as a patch. Often referred to as Eurorack*, these rack mountable components that can be combined and arranged in numerous ways to create new sounds. Everything from sequencers to oscillators to modulation can come in this form – like guitar pedals, this means a near infinite number of combinations! Similar to above, but designed for desktop use rather than rack-mounting. They can still be re-ordered and connected to create unusual sounds, but desktop modules also often work well as standalone units. Standalone units, sometimes with built-in keyboards or sequencers, with adjustable signal paths similar to a modular setup. Using the same modular connectivity, you can either reroute different components or connect to external components. A good starting point. While these groups encompass the bulk of what we call modular synthesis, there will always be grey areas – read on for the full lowdown! Modular synthesis started life in the mid-20th Century. While research was conducted from as early as the 1930s (most notably by Canadian physicist Hugh Le Caine), the first commercially available modular synthesizers were made by Moog (then known as R.A. Moog Co.) and Buchla in the early ‘60s. The concept was to take sonic frequencies and pass them through a multitude of different stages and processors, resulting in a huge variety of fresh & futuristic sounds. In the years that followed, Buchla and Moog continued to dominate, cementing themselves as pioneers of the idea – they became the go-to names for synthesizers. Electronic music became increasingly popular, and their synthesizers were used extensively to create futuristic sounds for film & TV. While Moog and Buchla specialised in sprawling custom-made units, other manufacturers entered in the area in the following years with alternatives. Roland released the System 100 & System 700 systems, boasting new interfaces and capabilities. Digisound (UK) unveiled the 80 Synthesizer, a kit-built take on the concept. It was clear from early on that these instruments had near-infinite capabilities, which resulted in a cult following that remains to this day. As components became more readily accessible and manufacture streamlined, modular synths became more and more affordable and easy to create. Nowadays, numerous manufacturers produce them in all shapes and sizes, and for all budgets. While digital synths and music software have come on leaps and bounds, many still prefer the sound of analog; think of it as vinyl vs. mp3. First of all, it’s worth covering the basics. Essential terminology, a few top tips and even a bit of science. How Do Modular Synths Work? MIDI – the universal digital music language, which gets converted into an analog signal for modular use. Most modern modular synths have direct MIDI inputs, but you can get separate modules that convert MIDI into analog voltages if not. MIDI can be fed from a keyboard controller, a sequencer, or even straight from your DAW with a MIDI interface. CV (controlled voltage) – this is the language that analog synths understand. This is often combined with your MIDI interface module. A controlled voltage can be used to control pretty much any component in a modular setup, including pitch. Synths almost universally abide by the 1V per octave rule – for example, the frequency generated by a 3V signal is one octave higher than the frequency generated by a 2V signal. VCO (voltage controlled oscillators) – these convert a voltage into an audible frequency. The oscillations of these frequencies form waveforms, the most basic of which is known as a sine wave. Most synths allow you to choose different waveforms depending on your preferred sound – more on this later. VCF (voltage controlled filter) – these allow further tweaking of your synth tone. While the waveforms essentially determine the ‘shape’, these determine the ‘voice’. They can be used to tweak the attack, decay, sustain and release of your sound (ADSR, also known as envelope), or as subtractive EQ filters (low-pass, high-pass etc.). VCA (voltage controlled amplifier) – pretty much what it says on the tin. This essentially controls the volume of the audio signal, and can be controlled by voltage to achieve different effects. For example, connecting an LFO to a VCA creates a tremolo effect, by steadily increasing and decreasing the volume of your signal. This is a standard patch that’ll give you a decent, recognisable synth sound. Even though is a proposed order, your CV will often control the VCF and VCA modules. This means that the volume, attack and shape of your sound will correspond directly with whatever your input source is. In semi-modular and analogue desktop synths, this patch is essentially pre-made to save you the effort – but as mentioned earlier, you can still tweak it. It’s also worth noting that some individual modules combine these components into one; for example, you might get a module that is a VCO & VCF component in one, meaning you just need to worry about input and output. This is how many manufacturers go about making modules with specific, pre-determined tonal characteristics. It’s worth mentioning that after the VCA stage, you can add any effects of your choice. While many effects come in modular/rack form, you can connect more or less any type of effect – including guitar pedals – to find your sound, as long as you’re careful with audio levels! As mentioned earlier, a VCO (voltage controlled oscillators) can have harmonics added or removed to create different shaped waveforms. These different waveforms have distinct sounds, and experimenting with them will help you find the tonal palette that suits you. Sine – pure and without harmonics. Also referred to as the fundamental, in that it’s the basis of all other waveforms. 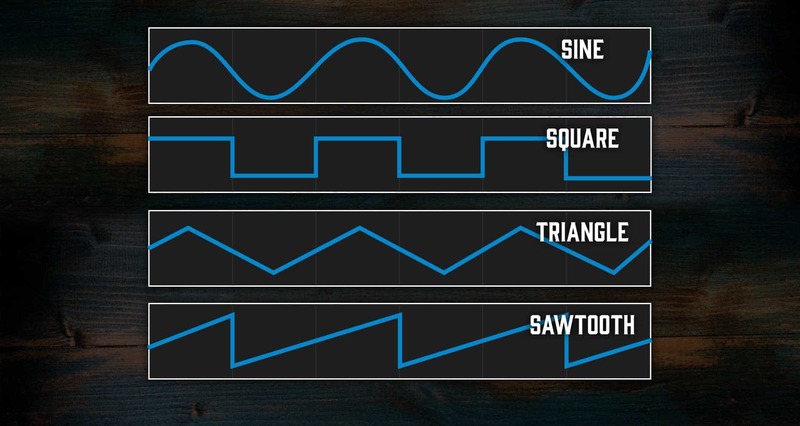 Sawtooth – a jagged waveform due to additional harmonics and overtones, a very recognisable sound. Square – a right-angled waveform that sounds less edgy than sawtooth but still prominent, with an old-school quality. Triangle – triangular as you may have guessed, with a hollow, sterile sound. These are the most commonly found waveforms, but there’s plenty of room in between and beyond. Because of the nature of harmonics, your options are pretty much infinite. Removing these harmonics using filters (VCFs) is known as subtractive synthesis, and is one of the easiest ways of tweaking a synthesizer’s tone. CV/Gate – these either come in the form of a mini-jack (1/8”/3.5mm, like a headphone connection) or 1/4” jack. They carry a controlled voltage signal which can be used to control most aspects of a modular setup, as well as a gate signal – this is essentially an on/off signal. It tells the recipient when to start or stop – like a key being pressed and released. MIDI – as mentioned earlier, many modern modular units feature MIDI compatibility. This allows better integration with modern technology like keyboard controllers and DAWs. It most often uses a 5-pin DIN connection. 1/4” Jack – when not being used for CV/gate purposes, the humble 1/4” jack can be used for audio in/out. This is excellent for using your modular setup with external effects like guitar pedals or connecting to audio interfaces. USB – many modern synths feature built-in USB compatibility. This allows bus power, and in some cases can communicate MIDI, which takes the native MIDI connection out of the equation. Analog waveforms are smooth and fluid, because there’s technically an infinite number of points on the frequency spectrum. This also results in a smooth, natural sound. Digital waveforms are made up of a series of numbers, meaning their waveforms are made up of sequential steps. This means that the signal isn’t quite as smooth as analog, even though they come pretty close to mimicking an analog curve. Many believe that there’s an audible difference as a result; there’s no right or wrong answer, it’s purely down to which one you prefer! This is one of the reasons why people swear by analog and modular synths – because their waveforms (and subsequently their tones) are smooth and dynamic. You may have heard the term Eurorack used a lot in conjunction with modular synthesizers. The term refers to the most common (nowadays borderline universal) physical format of modular synth gear. It was originally developed by German manufacturer Doepfer in the early ‘90s. The design included a height of 133.4mm, width measured in HP (1HP = 5.08mm) and connectivity via 3.5mm mono CV/gate cables. The format was gradually adopted by a number of manufacturers, who saw the advantage of users being to combine different types of modular gear. Nowadays, everyone from Moog to Roland offers Eurorack-compatible modular synth equipment! Now that we’ve covered the basics, we can explore some of the additional parts that you might need to consider. This includes ways of interacting with your modular setup, sound source options, and a pretty essential detail: power! Keyboards – as mentioned earlier, many modern modular gear features MIDI compatibility. This means that you can use any MIDI keyboard to control your analog modular gear. Brands like Arturia and M-Audio make simple and versatile keyboard controllers that can controller DAWs and modular gear. It’s worth noting that some more modern analog synthesizers even feature USB connectivity – this means an even more universal method of communicating MIDI information. Sequencers – sequencers send consistent, repeating signals to synthesizers, meaning you don’t have to do any playing. Sequencers are an extremely common signal source for modular setups, as they allow you to concentrate on tweaking your sound. By sending voltages (in sequences that you can specify and adjust), you can determine a melody, rhythm ostinato or even a drum beat, depending on your patch. Sequencers also crossover with arpeggiators, which arpeggiate your source input for cool, rhythmic textures. Power Supplies – one of the advantages of the adoption of Eurorack was universal power supplies. Many Eurorack power supplies provide power to multiple modules, with power buses allowing easy distribution of power depending on your needs. Multiples – a relatively uninteresting aspect that has a surprisingly useful function. A multiple will allow you to connect one signal to multiple components; for example, you may want your CV/gate to control both your VCF and VCA. These will split your signal and send them to more than one place. Seen by many as the titans of the category. Bob Moog helped pioneer analog synthesis during the 20th Century, paving the way for their huge popularity today. Now they offer some of the most sought-after gear in the industry. Everything from desktop drum machines to all-in-one Eurorack units. Shop our Moog range now! The Japanese manufacturer entered the analog synth world pretty early on. 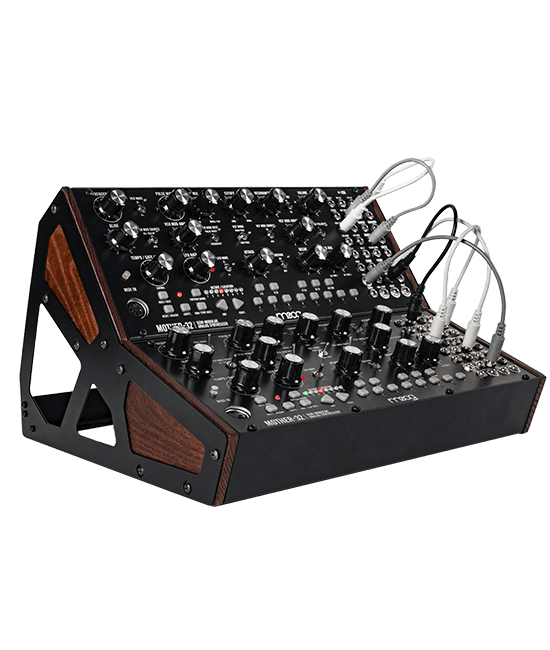 Their SYSTEM modular units remain hugely popular to this day, and their semi-modular & desktop units have a reputation for ease of use, incredible analog tones and surprising affordability. Shop our Roland range now! Waldorf are a major player in the digital synth/workstation world, but in recent years they’ve waded into the world of Eurorack and modular. As well as individual & and desktop modules, their KB37 controller offers an all-encompassing solution to setting up your rack. Shop our Waldorf range now! It’s in the name. These guys make Eurorack modules using the minimum standard width (2HP). Don’t be deceived by their size though; these tiny units offer a great array of sounds that continue to make waves (no pun intended) in the modular world. Shop our 2hp range now! Founded in 1981, Studio Electronics are among the old guard. Purveyors of some of the most popular and highly-rated analog gear in the world, they continue to raise the bar with their Eurorack, desktop and stompbox-format equipment. Shop our Studio Electronics range now! Founded in Grenoble, France in 1999, Arturia produce everything from Eurorack to digital workstations, and even a bit of software for good measure. Their analog synth offerings are popular for their intuitive interfaces and classy design, headed by their flagship Brute range. Shop our Arturia range now! Known for their hugely diverse range of affordable musical instruments and products, Behringer have always had synthesis close to their hearts. In recent years, they’ve unveiled a number of authentic (and affordable) recreations of classic synths, including the popular Model D.
Shop our Behringer range now! Canadian manufacturer intellijel make (as their name indicates) rather intelligent modules designed to change the way you think about your synths. Specialising in Eurorack, their modules boast simple colour-coded interfaces with a wealth of parameters and tweaking options. Shop our Intellijel range now! Frequency – we know what frequency means in a literal sense. When it comes to synths and waveforms, the same definition applies, but it’s referring to the frequency of cycles in a waveform. The higher the frequency of cycles, the higher the pitch. MIDI – stands for Musical Instrument Digital Interface. A MIDI connection can carry digital information relating to pitch, velocity, vibrato, panning, clock signals and more. A single connection can carry up to 16 channels, which can be linked to different devices. It’s the most common form of controlling synths, whether in a DAW or converted into analog for your modular setup. Sine wave – a waveform with smooth, continuous oscillation. A sine wave on a graph is recognisable by its consistent, equal curves and repeating cycles. In terms of synthesis, it’s the purest waveform, often referred to as the fundamental. Cutoff – as the name implies, this common synth parameter controls the cutoff of certain frequencies, acting as a filter. This control can be found on numerous filters, controlling the extent to which certain EQ frequencies are removed. When you tweak this control, you’ll hear your sound change drastically. Resonance – resonance adds a spike in the EQ at the cutoff frequency. By doing this, you produce a unique tone that ranges from hollow rumble to frantic screeching that wreaks havoc on your setup (in the best way possible). Amplitude – amplitude essentially represents the height of a waveform on a graph, which to a certain degree translates to volume. In synth terms, it’s used to refer to volume, but it can be modulated for unusual effects like tremolo. Polarity – a scientific term referring to whether a current is positive or negative. In terms of sound, it refers to the direction of a waveform in a cycle, i.e. above or below the zero axis. If you reverse the polarity (essentially mirroring the waveform) you end up with a shifted tone – this can help bring out missing frequencies or help tones sit better in a mix. Low-pass/high-pass – these filters allow or attenuate certain frequencies, a common effect used for dynamics in a mix or arrangement. Low-pass filters (LPF) passes frequencies below the cutoff point and attenuates (reduces) frequencies above the cutoff point. This ends up sounding like someone playing music next-door. A high-pass filter is essentially the opposite – it sounds like you’re wearing noise-cancelling headphones. Oscillator – in circuitry terms, an oscillator produces a periodic, repeating signal that repeats the same cycle. In synth terms, an oscillator takes a controlled voltage and turns it into an audible frequency; you tweak the oscillator to change the pitch and shape of the tone. LFO – stands for low-frequency oscillator, which is exactly what it sounds like – a slow oscillator. Oscillators usually generate waves at such a frequency that the oscillations are no longer individually discernible; they instead clash together forming an audible tone. When you slow it right down, you can hear it ebbing and flowing – this is used for rhythmic sounds, modulation effects like chorus and phaser, and much more.